Pepsi Fire will hit shelves nationwide next week. Peanut butter and jelly, cookies and milk – cinnamon and Pepsi? The curious new flavor of the cola classic is set to hit store shelves next week, according to a news release from Pepsi. The soda company is calling the new flavor "Pepsi Fire," and it's described as "refreshing cola with a cinnamon-flavored twist." The drink will be available for purchase starting Monday, though Pepsi's urging customers to "Get It While It's Hot"– the limited-edition flavor will only last until about mid-July. 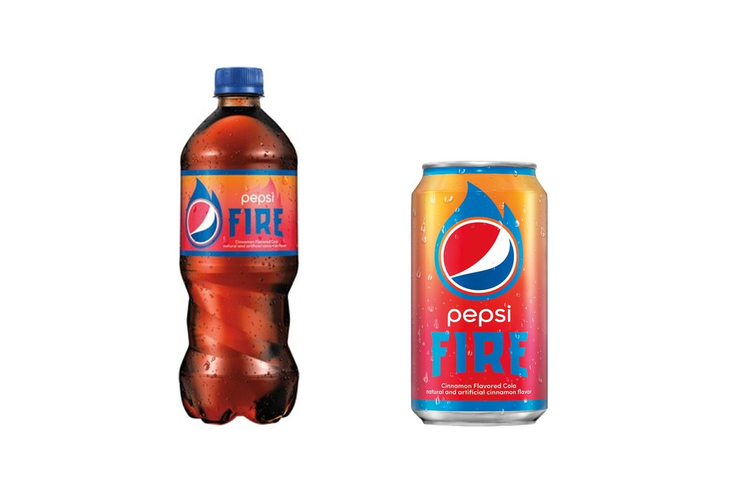 "Summer is one of the most anticipated times of the year, and Pepsi Fire is going to ignite this season with an unexpected and spicy twist to our classic cola taste," Pepsi marketing director Lauren Cohen said in a statement. Maybe it's a "don't knock it until you try it" kind of thing, but social media users are already questioning the unusual combination. Pepsi to try out Cinnamon-Infused “Pepsi Fire. Because who doesn't want a nice, cold hot drink? A Slurpee version of the drink is available at select 7-Eleven stores from now until June. It's gotten its fair share of mixed reviews, but one thing's clear – those who have already had a taste are comparing Pepsi Fire to Fireball, the cinnamon-flavored whiskey, minus the alcohol. That new @pepsi cinnamon slurpee at @ 7-11 tastes like fireball. Some, however, seem into the holiday-esque taste. Pepsi Fire slurpee - Reminds me of Pepsi Holiday Spice...except it has more Cinnamon. Anxious to try it? Philadelphians may have to shell out a bit extra and search a little harder for the new flavor, thanks to the soda tax. Pepsi responded to the city's tax by pulling 12-packs and 2-liter bottles from shelves in Philadelphia. Pepsi Fire is said to be sold in 20-ounce bottles and 12-ounce cans in 12-pack boxes. Pepsi also said that it was forced to lay off 80 to 100 workers at a distribution center serving Philadelphia due to slumping sales from the new tax.